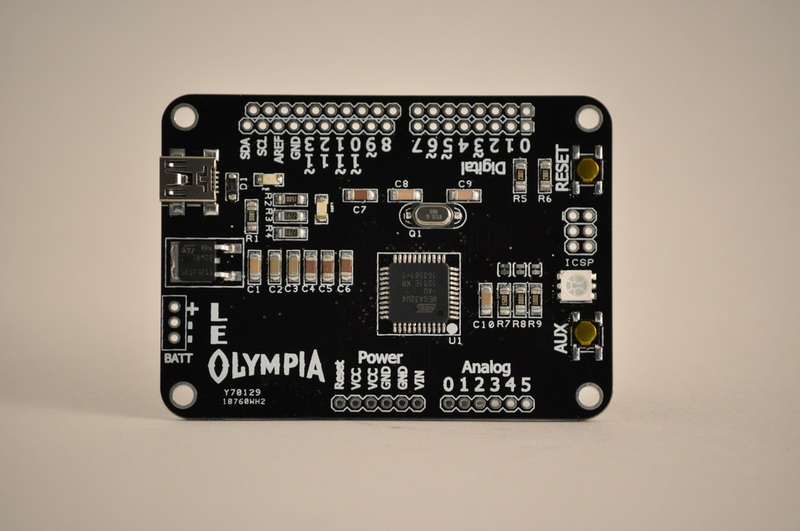 The LeOlympia is the next generation of prototyping board for the Arduino platform. It uses the 32U4 chip which delivers more capabilities to make your creations come to life. Use it to build interactive art, robots, or whatever else you can dream up. In addition to the normal Arduino functions, the LeOlympia can also act like USB devices such as a mouse or keyboard. 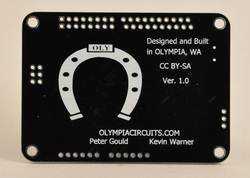 The LeOlympia is a Leonardo clone board. While the Arduino project has not released their version of a board utilizing the 32U4 chip, others have. Some of them are nice, small boards that allow users to test the features of the microcontroller, but aren't compatible with the Arduino Leonardo features. The LeOlympia project was based on Arduino information, the VinciDuino project and the Olimex project. The LeOlympia was designed with versatility in mind. Here are some of its unique features. A multi-color LED (RGB LED) is built onto the board. This is a fun and functional addition that allows the user to have any color of LED light for their project Also, there are many examples of LED fade sketches that can take advantage of the RGB LED. Solder jumpers (NC) are supplied which allow you to disconnect the LED. An integrated auxiliary input button. This is an extra button on the board that allows the user to use it as an input without external wiring. The button and RGB LED along with the typical green LED on pin 13, allow you to start using the board without a bunch of external components. We think this will make it easier to get started. It also will simplify many projects that Arduino boards are typically used for. The power connector is shipped loose and the board had space for several options. The standard is a 2-pin, 2.54mm space male header. This make an inexpensive, simple connection. Optionally, a 5.1mm spaced screw terminal will fit the board if you prefer that style of connection. The board had a longer form factor than and UNO board. This exposes the Reset, Aux Button and RGB LED, even with a shield installed. Double set of connections on the digital side. You know about the strange offset on Arduino boards, making it hard to connect to standard 0.1" header, right? We added a second row of terminals that are on an even 0.1" spacing. Use the outside row for shield compatibility or the inside row for breadboard compatibility. The LeOlympia ships with loose headers. While this will require a little soldering, it adds significant flexibility. The headers have long tails so that the board can be plugged into a breadboard. If you want to use with "standard" female headers, just clip the tails. Our favorite way is to put the headers in the spare parts bin and solder directly to the board. Loose connections make for many hours of frustration. Another minor, but useful change is that the mounting holes are in a rectangular pattern without components near them. So that you can actually use the holes easily. Here's the back of the board, not much action here. Not that you'll need it, but there's a horseshoe for luck.